Over time as a field engineer I face so many question and challenges, each time I got the opportunity to see my clients one on one, and one of the major questions is why is my internet speed slow?. So I guess it’s time once more for us to take look at some factor that has contributed to the slowness of your internet speed. 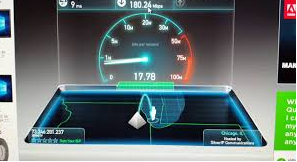 To discuss this am going to differentiate between megabit and megabyte the reason is because some internet service providers (isp’s), will tell you am giving you unlimited internet or they will say am giving you twenty megabit of speed per second (20Mbps), wow that’s really fast and I know everyone will buy to it. But all these strategies most times is to attract customers and subscribers attentions but here is real deal. Megabyte: I will explain megabyte as size or bundle probably a package that can be exhausted or used up at any time depending on the consumption of the user. At the this level whether you like it or all the internet subscription done here are capped with means that you have a dedicated size and bundle, specially for you and because they want to give you unlimited they will open you up to any speed you like (unlimited) to access your subscribed data, and the then user haven believe on the unlimited data will then be excited with the speed, and then keep browsing and enjoying the internet speed, now, the amazing thing is that in the next couple of days you will then , get a message saying that you’re speed has being reduced or that you have to buy extra data if you want to continue browsing the internet and what do we then get, complains, from our clients due confusions created by some ISP’s. This is the picture of how megabyte and a capped internet look like. Mtn 4G data/ mifi bundles services ranging from 10 megabyte up to 10 gigabyte or more. Glo 4G data/mifi bundles services ranging from 10 megabyte up to 10 gigabyte or more. Airtel data/ mifi bundles services ranging from 10 megabyte to 10 gigabyte or more. Spectranet 4G mifi bundles.to mention just but a few. It will interest you to know that these capped internet service providers have devices that are highly mobile which means you can carry them around every were, giving you access to unlimited online presence were ever you go. Capped bandwidths internet bundles are mostly meant for homes, personal and small organizations with less than ten users. We strongly advice filters like cyberoams to filter traffics and restrict user from abusing the internet subscription when capped internet is used for public and organizational Wi-Fi. Factors affecting capped bandwidths Internets: one of the factors affecting all these capped bandwidth internet includes what I called the pick period, this is that particular time when everyone want to access the internet, this is always later in the evening when everyone is at home, at this time the internet speed is share and this will always slow the speed of all the users because the shared bandwidth is no longer enough to accommodate everyone thereby causing congestion. Megabit: This is speed at which the user access information from the internet. We will all agree that in digital communications, information are being fragmented into sizes when encoding and decoding, this simply means that we access information in sizes and also upload in sizes, what this means is that if you have a file or a picture to upload or download from the internet you will observe that often times if not all the times when downloading you will see 10% of 100% downloading this 10% will continue to increase until the file finish downloading. The increase is the speed at which you access the internet and this is the basic concept of megabit. In megabit the ISP offers uncapped internet, and no one sends you message telling you have exhausted your data and all that the only thing is you paying for is the speed to access the internet that all more you experience complete unlimited within you subscribed duration. Bit : It is the unit of information that we use in our computing and also in communications. The word ‘binary digit’ is shortened to form the word ‘bit’. It can have values such as ‘on’ or ‘off’,‘+’ or ‘-‘, ’Yes’ or ‘no’, ‘true’ or ‘false’ or any other values that can have only two opposite attributes. Byte: It is the unit of information that is used in digital fields and is equals eight bits. Mb: Mega bit. It equals 103 bits. It is used to denote the storage capacity of any electronic storage device. MB: MegaByte. It equals 103 Bytes. MBps or MBps or MB /s MegaBytes per second. It is used to specify the speed of transmissions in terms of Bytes. mbps or Mbps or Mb /s Megabits per second. It is used to specify the speed of transmissions in terms if bits. uncapped bandwidth internet services is used for homes, and cor-operate organization. These service are available for both microwave internet radios and fiber optics. Internet solutions Nigeria limited. to mention just but a few. Factors affecting uncapped bandwidth internet : one major problem with this internet is that in some organization, some persons on the network are being marginalized by others, which means that some persons, can occupy the entire bandwidth by queuing up downloads, uploads or even streaming for hours, leaving other suffering and stranded when trying to upload files or do other jobs. Whatever subscription that suits your organization, is of personal choice having seen the difference above there is no need to pay for expensive ISP, with less than five staffs in your organization but in all, a good internet is worth paying for. ← Will Apple Activate the iPhone’s Hidden FM Radio ?.